Import images from any source: slide scanner, flat bed scanner, optical microscope, SEM electron image, cell phone camera, etc. See your sample in true color as you navigate using the optical (or other) image as a “base map”. Once your image is calibrated, double-click to drive the stage to the exact sample location. Right-click to create unlimited sample annotations with stage coordinates that are automatically saved and exportable. Free download for Demonstration and Text Input based stage coordinate modes! Text Input mode allows you to utilize PictureSnapApp on *any* instrument stage, e.g., SIMS, LA-ICPMS, AFM, etc.! 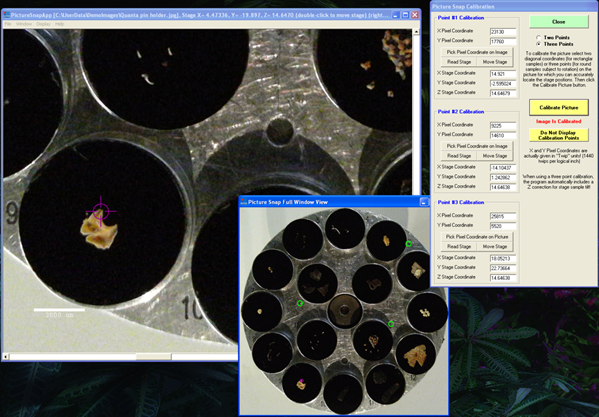 Automatic coordinate transformation to easily move images and annotations from one instrument stage to another, for quick and easy relocation of sample areas of interest. "PictureSnapApp has been a great boon to our laboratory. Even people who have me do all the microscope work think it's a fantastic tool! It gets complements all the time. It has greatly sped up our geology work on large-scale thin sections, and made small sample location a breeze in any context, even things that are nearly optically invisible such as zircon grains in epoxy. If you want to find your samples fast without poking around in the dark, PictureSnapApp is your new best friend." "PictureSnapApp is the best and most powerful tool to link different instruments for my research. Now PictureSnapApp is used to navigate not only polished thin sections of terrestrial and extraterrestrial rock samples but also unpolished fossil samples with optical microscope, scanning electron microscope, electron microprobe, and Raman spectroscopy. It is surprising that the program is free to use! I would certainly recommend PictureSnapApp as a sample navigator for your research." About Us | Site Map | Contact Us | © 2005-2018 Probe Software, Inc.